MMA is full of opportunities for fighters to send messages. Whether it is through a knockout victory or a lopsided judge’s decision; the competitors inside the cage have the ability to use combat sports to really make statements. In that context, a losing fighter is often left unsatisfied as they were not able to secure that opportunity in defeat and more often than not, that sour taste is left in their mouths for their entire careers. Statistically speaking, rematches come very few in MMA and unless we are talking fights within the UFC ranks, when a fighter loses they typically must live with that defeat for the duration of their career. This weekend on October 5th at the King of the Cage “Future Legends 18” event, the rarity of receiving a rematch in the amateur ranks will come to fruition as Judgement MMA’s Amanda Lovato (2-1) will have a chance to even the score with FIT NHB’s Nikki Lowe (4-3). In all actuality, this will actually be the women mixed martial artists third time competing against one another. Both Lowe and Lovato threw all they had at one another back at a FIT NHB kickboxing smoker in 2012. Back in 2012, Lovato and Lowe would meet up at one of Lowe’s home gyms kickboxing smokers. The FIT NHB’s popular “Battlegrounds” events would be host to the pair’s first bout contested under kickboxing rules where the fight was not even six minutes in length from start to finish. In that bout, Lovato’s reputable aggression would set the pace early on only to see Lowe take over in the latter half of the fight. A tiring Lovato would succumb to a late referee stoppage with seconds left in the final frame when Lowe would turn up the pressure, tagging Lovato at will forcing the stoppage. Fast-forward to June 15th, 2013 which was only a little over 16-weeks ago; Lovato and Lowe would once again find themselves staring across the mat at one another only this time fighting under MMA rules where they would leave the headgear behind and pick up four-ounce gloves. Much like the first fight, Lovato would start the bout the same way she has every MMA bout in her amateur career; fast, aggressive and right to the point. While Lovato would enjoy the stand-up advantage early on, it would be Lowe who would look to add another dynamic to the fight as she attempted to push Lovato into a grappling war. While the savviness of Lowe shined on the mat where she had a grappling advantage, the tenacious Lovato was game to battle where she clearly was at a disadvantage. The first round of action would end and the fight was already looking a lot like the action packed kickboxing bout a year before. The second round would not last so long as Lowe would quickly and slickly secure back mount on a grounded Lovato and sunk in a fight ending rear-naked choke submission. The ending was emphatic for Lowe and would leave Lovato in the whole 0-2 in the friendly mini-rivalry between both women. Lowe has taken two victories over Lovato in the smoker and amateur MMA ranks. This time around, both WMMA fighters are very close to turning professional and the third combat bout between Lowe and Lovato have big-time implications as to showcasing which fighter is most ready for the conversion. Lowe has the opportunity to show her outstanding skills once again by defeating a fighter who has now has had three cracks at defeating her. Lovato has the rare opportunity to write the ship so to speak by showcasing her progression and improvement against a fighter who has beaten her in the stand-up and ground game. Either way, we should expect fireworks from two fighters who have loads of experience competing against one another. 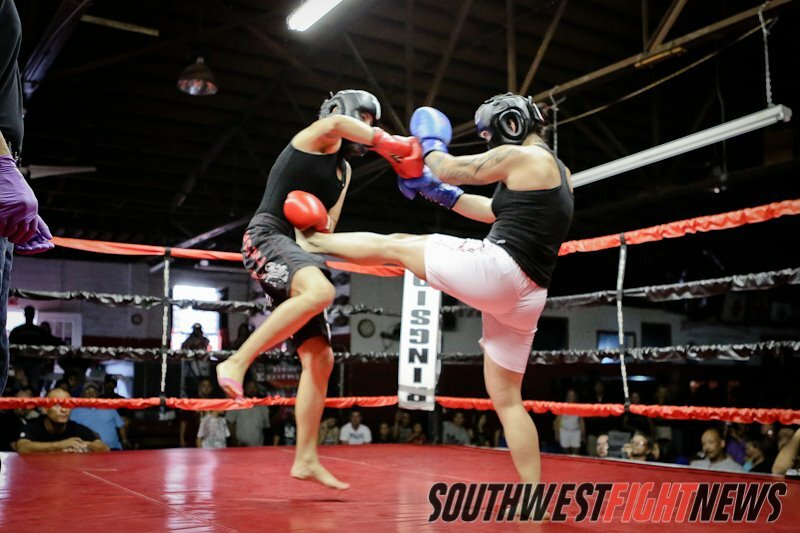 The FIT NHB trained Lowe is sure to bring with her that polished Thai boxing that Tom and Arlene Vaughn instill in their fighters. 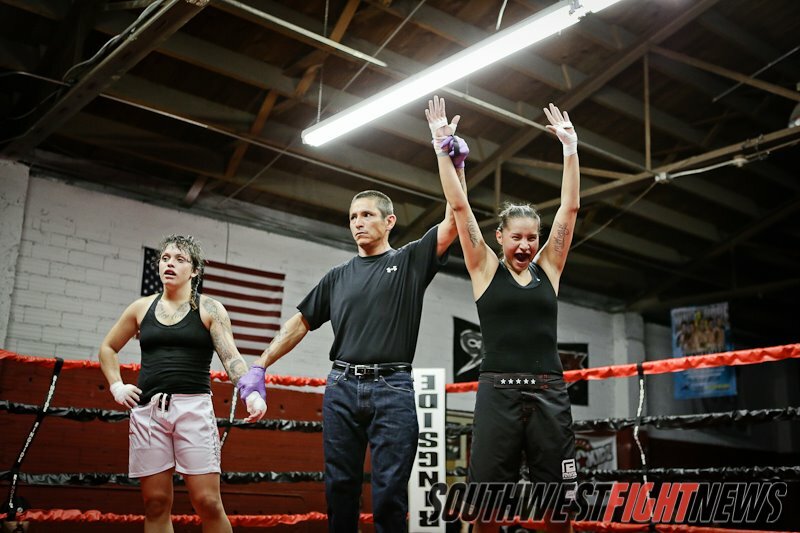 Add in the well-round talent that Lowe has in her ground skills and we have yet another women fighter to add into the wave of successful female athletes coming out of the Albuquerque area. She joins teammates Brenda Gonzales and Amber Brown as the very talented trio coming out of the downtown Albuquerque gym. The fight will feature Lovato’s aggression once again battling Lowe’s countering ability. Lovato comes out of Rio Rancho’s Judgement MMA where Scott and Robin Marlowe have a strong nuclei of young talent exploding out of their gym walls. Head Coach Scott Marlowe’s striking arsenal focused around the high-pressure offense and plethora of kicking attacks shines bright in Lovato’s tool kit and working with Jiu Jitsu Ace Rich Chavez only sharpens the dangerous striking attack that Lovato has become known for. While there is not any indication as to whether this bout will be one of the “featured” fights on October 5th’s fight card, fight fans should not expect anything less than a spectacular fight between the two tenacious fighters. Stay tuned to SWFight.com for more event coverage, bout breakdowns and analysis. As always we encourage the local fight fans to make their way out to the show which is scheduled for Saturday evening at The Crowne Plaza Hotel. Stay tuned fight fans, this card is full of some of New Mexico’s youngest and best amateur talent. Make sure to check out the Awakening website (http://www.awakeningfighters.com/) to check out a destination that focuses solely on the ladies of combat sports. Included on the site, Amanda Lovato’s very own profile (http://www.awakeningfighters.com/athletes/amanda-lovato/). The database of women athletes is quite extensive, very informative and quite useful.